Buddhist Insights for Finding Meaning and Joy in the Face of Suffering. Why do we suffer? Is there a purpose to our pain? Noting that human beings have wrestled with such questions for thousands of years, Phillip Moffitt has found answers for his own life in Buddhist philosophy and meditation. Reflecting on his own journey from Esquire magazine editor-in-chief to Buddhist meditation teacher, Moffitt provides a fresh perspective on the Buddha's ancient wisdom, showing how to move from suffering to new awareness and unanticipated joy. In this deeply spiritual book that is sure to become a Buddhist classic, Moffitt explores the twelve insights that underlie the Buddha's core teaching--the Four Noble Truths--and uses these often neglected ideas to guide readers to a more meaningful relationship to suffering. 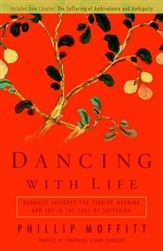 Moffitt write: "These twelve insights teach you to dance with both the joy and pain, finding peace in a balanced mind and calm spirit. As the most specific, practical life instructions I have ever encountered, they serve as an invaluable tool for anyone who seeks a life filled with meaning and well-being." Practicing these twelve insights, as Moffitt suggests, will help readers experience life's difficulties without being filled with stress and anguish, and they will enhance their moments of happiness. With engaging writing and a strong message of self-empowerment, Dancing with Life offers a prescriptive path for finding joy and peace that will appeal to meditation students and readers of "Dharma Wisdom," Moffitt's column in Yoga Journal, as well as anyone searching for a more authentic life.